Two level private oceanfront balcony Unit recently decorated by a prestigious designer. Fully equipped kitchen. Spacious condo completely furnished. Separate TV room. Access to balcony from TV room, dining room and master suite. King master bedroom with access to private balcony and ensuite bathroom. Dream bedroom Second room with king size bed and Jack & Jill bathroom. Private balcony access from every room. Third bedroom with queen size bed. Unit`s floor plan. View from the rooftop cover terrace. Lost Beach Bahia Encantada. Bahia Encantada. Beachfront pool. View from the pool. Perfectly manicured grounds. Romantic getaway. This beautiful and spacious three bedroom, two-and-a-half bath penthouse condo comfortably accommodates families or groups of up to 6 people and comes fully furnished with everything you'll need to enjoy a relaxing, carefree vacation. This unit features a whopping four private balconies where you and your guests can dine or lounge in style while taking in stunning views of the sprawling beach and ocean below, including views from a fabulous rooftop terrace. The sizeable kitchen is fully equipped to meet all your cooking and entertaining needs, with full-size stainless steel appliances, granite countertops, a large breakfast bar and access to the lounging balcony. Other kitchen appliances include a fridge, freezer, dishwasher, oven, toaster, blender, coffee maker and microwave. The open-concept living area features comfortable seating, a flat screen TV, and access to the dining balcony. The master bedroom features a king-size bed, in-suite bathroom, flat screen TV and sliding door access to the dining balcony. The first guest bedroom features a queen-size bed, shared in-suite bathroom, and access to a private guest balcony. The second guest bedroom also shares an in-suite bathroom and features two twin-size beds and access to another private guest balcony. Visitors have access a a half-bathroom off the main hallway. Premium linens, plush pillows, tasteful décor, and a full-size washer and dryer unit top off the long list of amenities included with this unit. 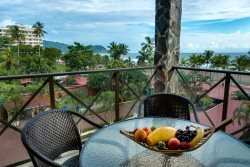 If you're looking for a tropical vacation rental with comfortable and luxurious accommodations, ample amenities and stunning views, this unit has everything you need and more!